When the murdered peddler who appears in "Maggie Fox Speaks"  started rapping from his grave under the floorboards on the Fox family house, "the Spiritualist movement that swept nineteenth century America" began, Shipers' note to the poem tells us. 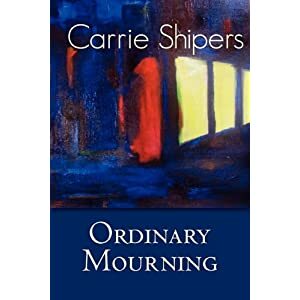 Ordinary Mourning, which takes its title from a Victorian stage of grief, is much taken with 19th Century Spiritualism and with ghosts, particularly ghosts as they appear on the lonely stretches of prairie in the middle of America. Chosen by the poet Mark Halliday for the First Book Prize from ABZ Press, Ordinary Mourning owes to the poet Ted Kooser (whom Shipers thanks for "feedback") its plainspoken, folksy diction, a diction that does not vary much whether the poem's persona is a Victorian housewife or a 911 responder, but owes to Frost its touches of darkness. These are simple narratives in a mild, unambitious style, the descriptions rendered lightly, often deftly. The scenarios and settings include graveyards, coal mines, caskets, hospitals, séances, lonely stretches of highway, empty prairies, the parlors and sitting rooms of the recently deceased and the long dead, even the Winchester Mystery House. Shipers' dead, more lively than the living, speak to each other, complaining about the living and reporting on the other side. One ghost "expected mist or fog drifting, not this hard/Hopper light. . ." For the dead, the ground slowly unfurls as they walk toward the horizon. Some dead continue working, "truckers with phantom rigs; miners of closed shafts; farmers who ply the fields in which they died." Of the two, living and dead, the living are the more dangerousand just as sentimental. Some encounters are spooky, others more banal. The morning after a young woman graduates from high school, she finds her dead stepfather "eating chocolate cake in the living room./She said, "Good morning." Not all the poems have ghosts. In "Reparation,"  miners commit suicide after an explosion in a mine whose safety they were supposed to monitor. In "Open House,"  a widow grieves for her husband, who has killed himself; what haunts her is not his ghost, but her grief. "I'll take him back in any form he chooses--. . . /I'd give anything/to see his ghost." Several poems draw on 19th Century prairie folklore and history. "Lucy Bell Speaks" [28-29] recounts the spectral woes of the Bell family. After a roadside accident recounted in "Surrogate Ghost" , grieving parents sit by a girl's bedside mistakenly believing her to be their daughter. Ghosts appear rather ominously on the photographic plates of the 19th Century photographer William Mumler in "--" [38-39]. Shipers' narratives are straightforward, her language simple. The unvaried tone offers the book a kind of unity, as if it were one long poem, but in the end flattens the texture and saps the poems of vitality and verbal surprise. As an artistic conceit of resurrection, what does Ordinary Mourning tell us about our lives? Shipers has a well-controlled, light touch, but the poems sometimes let in more hilarity than she intends. The homesteader who must live with the ghost of the wife he killed with an axe because "Out here, we have to live with our mistakes"  is pure kitsch. And when the Caretaker in the poem of that title says, "I used to think/the newest dead would have the most to say,//but something keeps them from speaking,"  I thought, Yes, indeed. soot-fingers, grind it between coal-teeth. I begged the poison from our priest. Shipers' talents are by no means ghostly. Zara Raab's reviews have appeared in Poetry Flash, Rattle, Poemleon, and are forthcoming in Poet Lore, Valparaiso Poetry Review and the Colorado Review, as well as Raintown.